The rice that grown exclusively in mineral rich soil, with organic fertilizers, and is allowed to ripen naturally without any stimulants to accelerate the growth process. Thus, it does not contain any toxins. Exhaustive scientific research as to the quality, nutrient and method of production convinced the company that this rice was a necessity for the Malaysian diet. Being a high quality product from India, Taj Mahal is the most obvious brand name choice. In Malaysia it has become synonymous with health because it contains less carbohydrates and starch, meaning it is acceptable to those with diabetic or high blood pressure conditions. 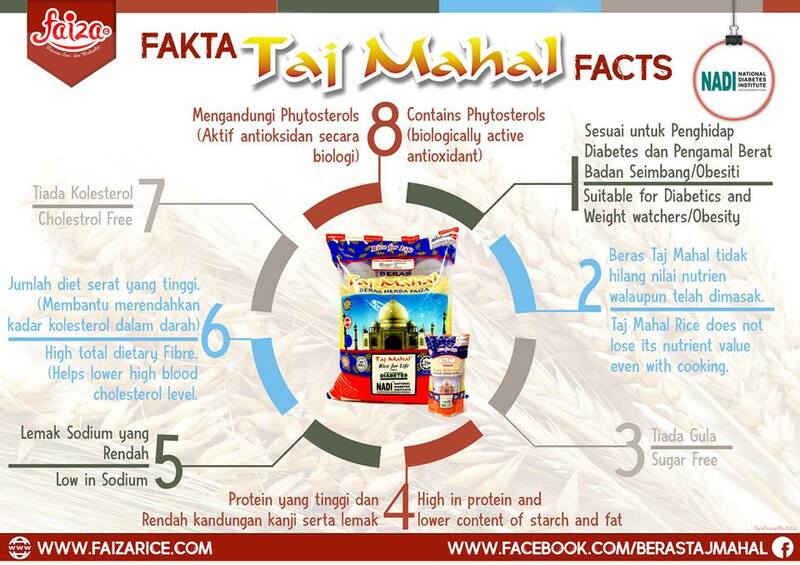 When Taj Mahal rice is cooked, it increase to three times it original size. It is wholly sun dried naturally, at 40 degrees celcius, to help the goodness in the rice. The high calcium content make it the best choice for the family as it protects bones and teeth. The amino acids in the rice are and added bonus, helping the consumer to remain youthful and in good health.